“Energy costs can be a huge burden on your business finances, especially if you operate in an energy intensive sector like manufacturing. “Smart meters make it easier to buy and use energy more efficiently. The technology is used widely by larger companies but many small to medium-sized firms still aren’t using smart meters effectively. A smart energy meter has a range of intelligent functions. It can report consumption on a screen in real time. It also automatically reports consumption to your supplier, meaning there’s no more estimated billing. The national rollout of smart meters to homes and business will benefit the suppliers, the network and, most importantly, the end-users. It has been a requirement for large (and some medium-sized) firms to have a smart meter since at least 2009. But many smaller, non-domestic sites (approximately 2.1 million electricity sites and 1.5 million gas sites) still haven’t received one. So what should you do when you get your smart meter? We’ve identified some top smart metering tips which are easy to apply and could save your business a lot of money. 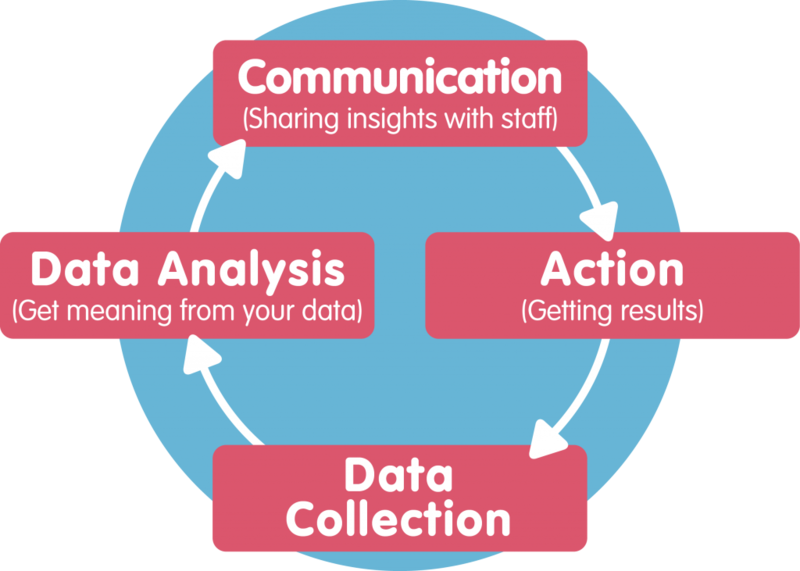 Data collection – using meters and sensors to gather as much relevant information as you can. Data analysis – using techniques, tools and expert help to extract some meaning from your data. Communication – passing on any insights to staff and other stakeholders. We’re going to unpack these theoretical principles and add some practical advice as we go along. If you would like to learn more about the theoretical side of energy management then here is a good introduction from the Carbon Trust. Are You Wasting Energy Overnight? Wasting overnight energy is an easy place to start. Clearly, some businesses will have equipment, like refrigerators and alarms, which need to be running all the time. But non-essential equipment left on overnight will, by definition, be wasting energy. Spotting overnight waste is quite simple if you have the right tools. By using a smart meter and some monitoring technology (many suppliers offer monitoring software as part of their package but you might want to source your own energy management programme) you can track a sites overall energy consumption over a long period of time. Over a few months you should start to see a baseline for overnight energy use when the office is empty. This level will be the level at which only essential equipment is operating. If, on any day, the level of consumption strays above this base line, then you know that energy is being wasted. If this happens consistently then it might be worth taking action by, for example, putting all non-essential equipment on a separate circuit-breaker which can be turned off automatically when the site closes. 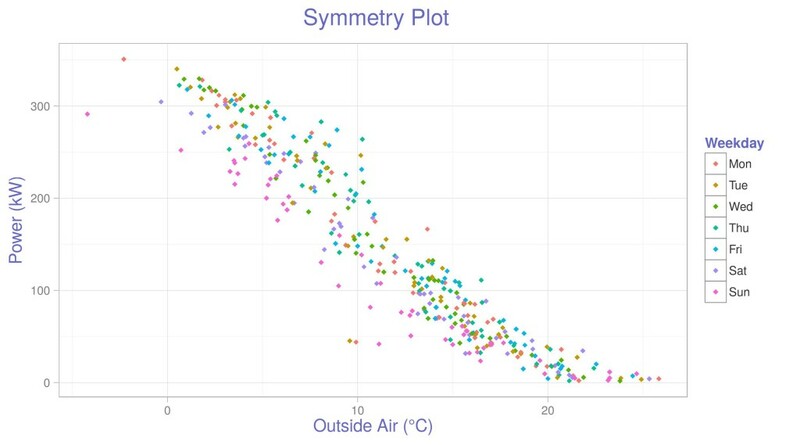 Other data sets can be used to provide context for your energy use. Information about temperature can be useful for obvious reasons. Collecting this data might sound arduous, particularly if you are busy trying to run a company, but there are ways to automate the collection and store it in a spreadsheet. 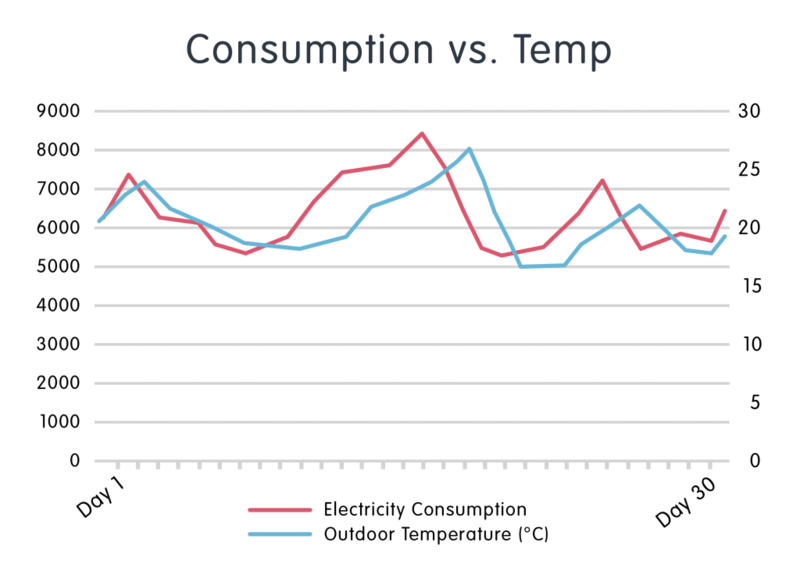 The above graph shows outdoor temperature set against electricity consumption in a particular month. If we assume that everything else remains equal, then the closer the consumption line gets to the temperature line, then the less waste there will be. There are other data sets which can be useful. If you operate out of an office block, for example, then energy consumption should relate in some way to the number of staff you employ. Alternatively, if you run a hotel then consumption should relate to the level of occupancy. The EPSRC universities project collected all sorts of data using lots of low cost sensors. They then used this information to reduce energy consumption in a number of creative ways. By getting creative with your own business you will unearth all sorts of potential energy savings. “Simply installing a smart meter is not enough to bring down your consumption. And watching the data tick over in real time is not much better.It is absolutely crucial that you process this raw data and turn it into actionable information, or else employ someone to do this for you. 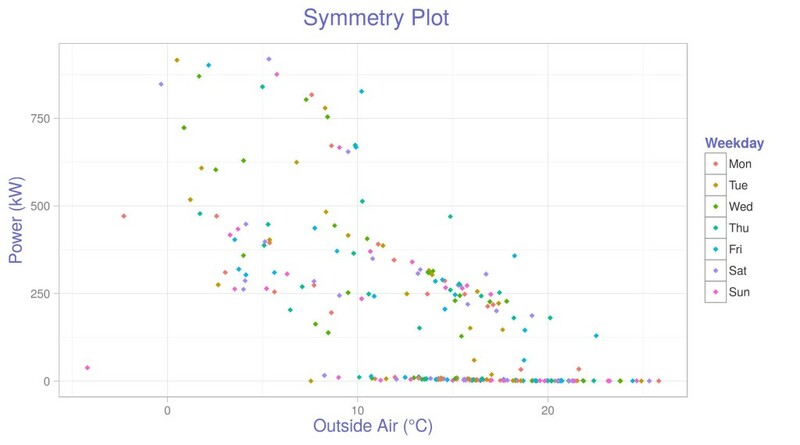 A smart metering project will only be successful if it involves good data analysis. A lot has been made recently about the possibilities of ‘Big Data’. But a lot of small businesses don’t have the experience or the capacity to make the most of it. Measuring a site’s total energy consumption will give you some base-level insights, but for more significant savings you have to go deeper. Sub-meters can show you more accurately how energy is distributed and consumed within a site – in a particular department for instance, or for different applications. A sub-meter sits beneath a smart meter in your premises’ ‘hierarchy’, measuring the amount of energy used by an appliance or group of appliances. Sub-meters can be used to gather information about energy usage on a particular floor of an office block, or in the refrigeration section of a warehouse. 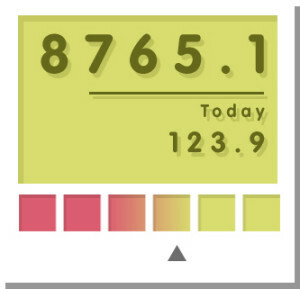 This kind of information lets you make more informed decisions about energy usage. If you can prove to your site manager that an appliance is using too much energy, then you’ll have more chance of getting a replacement with a short payback time. Smart meters educate customers about their energy consumption. 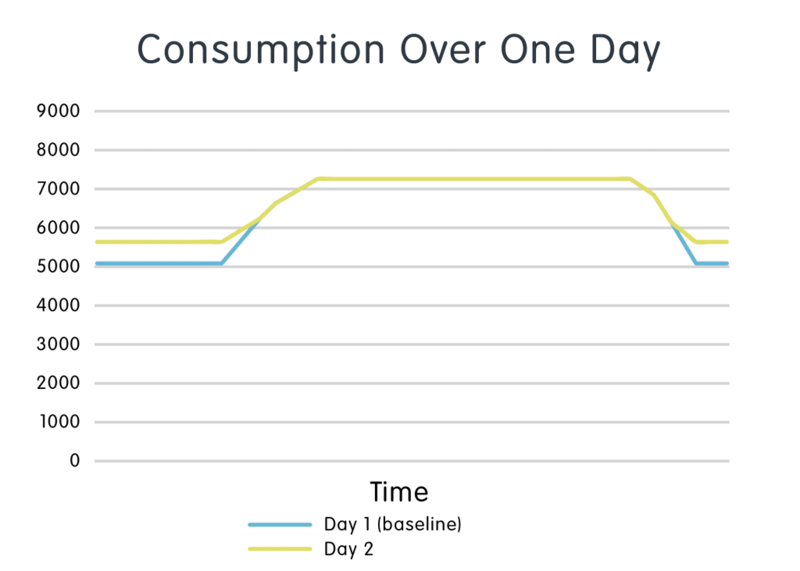 The argument behind the governments smart meter rollout says that if end-users are aware of how much they are consuming they are more likely to reduce consumption. The ‘end-user empowerment’ argument is neat as long as the end-user is the one paying the bills. This works in the domestic setting but for non-domestic premises the answer is a little more complicated. Any messages about consumption have to be filtered through the employees who hold a high degree of power over how much energy gets used. Feedback on consumption is necessary for energy savings. Good feedback is clear, easy to interpret and expressed in terms that a user can understand. If consumption is ‘invisible’ then workers are unlikely to moderate their consumption by, for example, turning lights off. Flat sentiments like ‘this machine uses 0.945 KwH of electricity per use’ or ‘turn off the lights’ aren’t very compelling. Specific ‘cost’ data messages like ‘this machine costs us £1,000 every month, please use responsibly’ will almost certainly have a bigger impact on your workforce. By publishing and distributing information about total energy usage week by week or year by year, you can set measurable efficiency targets. And, importantly, you can track tangible results from actions which can often feel futile to the employee. For businesses which are billed on a half-hourly basis, efficient consumption isn’t just about eliminating waste. It’s also about using energy at the right times. During times of peak national consumption (between around 16.00 and 18.00) energy is more expensive. Businesses which purchase at flexible, half-hourly rates should be taking steps to reduce their consumption when the unit rate is high. Manufacturers and other companies with energy-intensive processes might consider opening longer hours and performing the most costly operations at night. Clearly there will be lots of businesses which don’t have the luxury of postponing energy usage like this. A hotel, for example, cannot simply delay turning on the lights when a guest wants. There are lots of innovative ways in which even the most essential consumption can be relieved. Take this Marriott hotel in London. They followed a strict ‘energy demand-reduction’ programme, making incremental changes to electricity consumption to relieve short-term pressure on the national grid during hours of peak demand. Much of the advice published in this guide will only be applicable to certain types of companies. This is because every business in every industry has a unique energy consumption profile which makes generalising difficult. While many of the principles are transferable, much of the specific advice might be difficult to implement. This is why we recommend seeking outside help if you want to see drastic improvements in your energy situation. Data collectors will be able to spot patterns and make recommendations based on any information you collect. They also have access to software and tools which many small businesses cannot justify buying. Here at Utility Helpline, we do everything we can to help customers reduce their energy bills. We work closely with some of the industry’s best data collectors and energy analysts to help clients save energy and money. Our favourite thing about smart energy meters is that they make switching energy suppliers a breeze. Small business owners frequently cite the hassle involved with switching as one of their biggest turn-offs to making the leap. Smart meters and good energy brokers eliminate this hassle. There’s no need check the meter, or call out an engineer to verify the reading. The smart meter communicates all of the information directly to the supplier. We specialise in helping businesses make the energy switch. Utility Helpline works for our clients, not the big energy companies. That means we always get the best possible price for our customers. Get in touch today and find out how much we could save you.